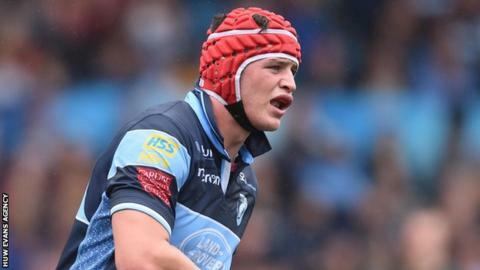 James Botham, grandson of England cricket legend Sir Ian Botham, has signed his first senior contract with Cardiff Blues. The back-row forward was joined by tight-head prop Keiron Assiratti and Shane Lewis-Hughes in signing first professional deals. Wales Under-20s international Botham is the son of former Cardiff wing Liam. Assiratti has played at all Wales age grades having graduated from Rhondda clubs Wattstown and Treorchy. Assiratti has also played for Pontypridd and Blues A.
Botham said: "It's great to sign my first professional deal and I'm really happy it's at Cardiff Blues, where I've spent the last three years in the academy. "It was a massive honour to make my Pro14 debut earlier in the season having played a lot in the Anglo-Welsh Cup, in the A-League and Cardiff RFC - now I am hungry for more." Blues head coach John Mulvihill said: "James carriers well, competes hard on the floor and brings good enthusiasm and energy." Since his 2016-17 debut Assiratti has made 25 Blues appearances, including six during 2018-19. "I'm determined to do everything I can to secure a regular first team place," said Assiratti. To do so, Assiratti must overhaul Wales' Dillon Lewis, Moldova's Dmitri Arhip and Scott Andrews in the battle for the number three jersey. Mulvihill said: "He's most definitely a player with a big future at the Cardiff Blues and, in time, internationally, providing he remains focused and continues his hard work." Lewis-Hughes, a blind-side specialist, has also impressed Mulvihill, who said: "Shane has taken his opportunities well this year and has had real impact in some of our biggest games this season."